If we lack an expression for the anti-derivative F, we cannot apply the fundamental theorem of calculus, but the integral can be valued using numerical methods of integration. 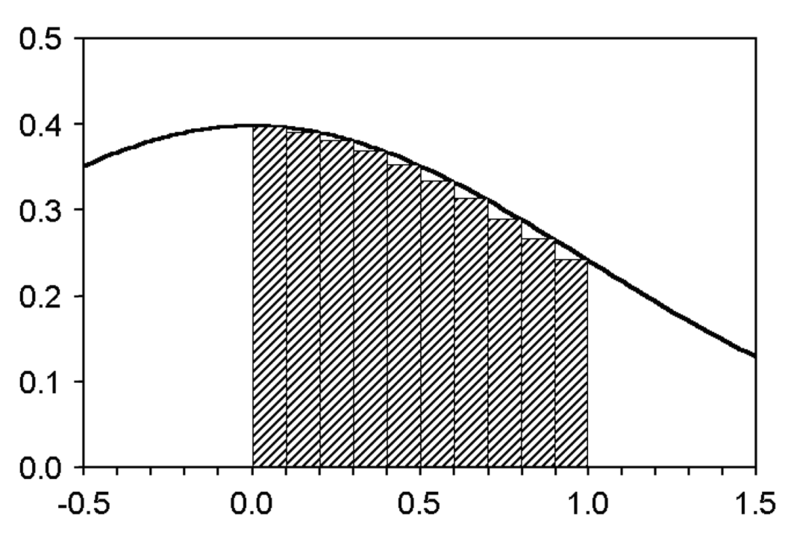 In this section, we consider techniques based upon Riemann sums or generalizations of Riemann sums. for some a, b ∈ . With the method of Riemann sums we approximate the integral by dividing the interval [a,b] into m subintervals and approximating f with a constant function on each subinterval. There are more efficient ways this might be evaluated, but let’s approximate a solution with a Riemann sum. 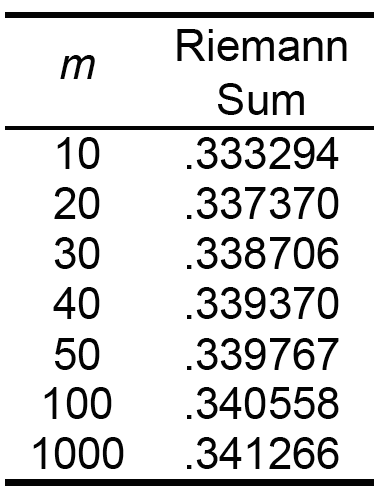 Setting m = 10, our subinterval length Δx is .10. Computations are presented in Exhibit 2.23. Exhibit 2.23: Calculations to approximate [2.180] using a Riemann sum with m = 10. We are approximating the integral by summing the areas of 10 rectangles. This is illustrated in Exhibit 2.24. Exhibit 2.24: Graphical depiction of our Riemann sum calculations. 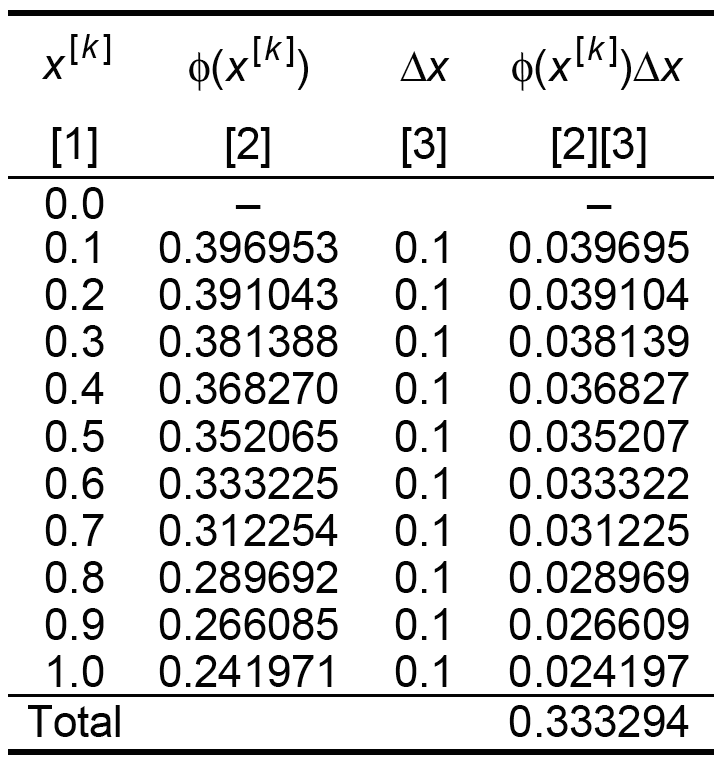 We can improve our approximation by valuing the Riemann sum [2.179] for a greater value m. Results for selected values of m are shown in Exhibit 2.25. Exhibit 2.25: Approximation [2.179] or [2.180] improves as m increases. The trapezoidal rule is a form of numerical integration that works in the same manner as Riemann sums. Instead of approximating f with a constant function on each subinterval of [a,b], it does so with a linear polynomial. The region under that linear polynomial is a trapezoid. 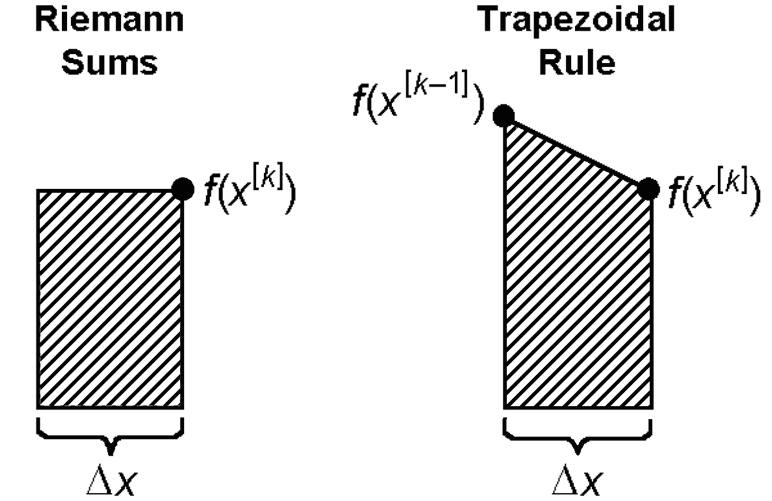 Exhibit 2.26: The trapezoidal rule employs trapezoids instead of the rectangles employed by Riemann sums. Let’s apply the trapezoidal rule to the same integral [2.180] to which we applied Riemann sums. We apply the trapezoidal rule [2.183] with m = 10, so our subinterval length Δx is .10. Our calculations are presented in Exhibit 2.27, and the work is illustrated graphically in Exhibit 2.28. 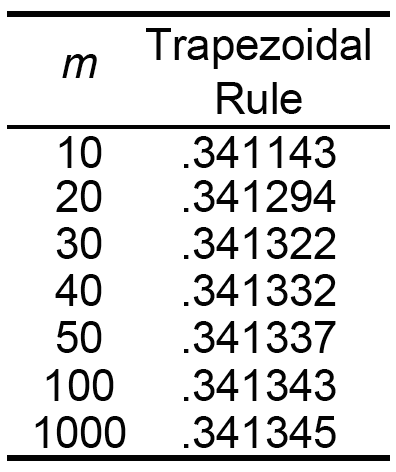 Exhibit 2.27: Calculations to approximate [2.180] using the trapezoidal rule with m = 10. Exhibit 2.28: Graphical depiction of our trapezoidal rule calculations. 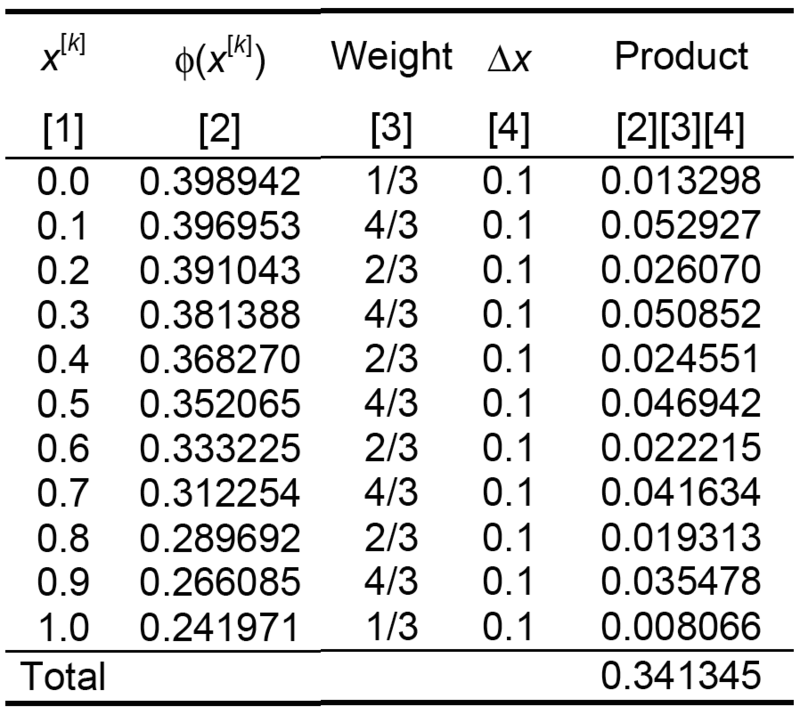 We can improve our approximation by increasing m. Results for selected values are shown in Exhibit 2.29. In this example, the trapezoidal rule achieves with m = 20 a result superior to that obtained by Riemann sums with m = 1000. 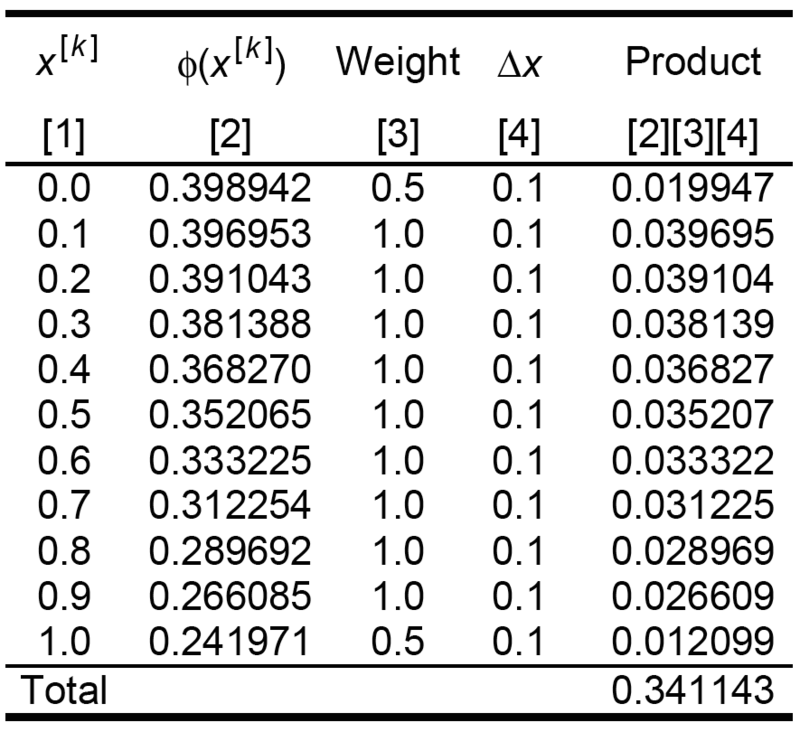 Exhibit 2.29: Example results are excellent for the trapezoidal rule, even with modest values of m.
Simposon’s rule is a third method of numerical integration. Instead of approximating f with constant functions or linear polynomials, it does so with quadratic polynomials. To evaluate an integral [2.178], we select a partition p of the interval [a,b] for some even number m. On each pair of consecutive subintervals, the area under f is approximated with the area under a quadratic polynomial. Exhibit 2.30: The method of Riemann sums approximates f with constant functions on each subinterval. The trapezoidal rule approximates f with a linear polynomial on each subinterval. Simpson’s rule approximates f with a quadratic polynomial on each pair of consecutive subintervals. We apply Simpson’s rule [2.185] to the same integral [2.180] as in our previous examples. Setting m = 10, our subinterval length Δx is .10. Our calculations are presented in Exhibit 2.31. Exhibit 2.31: Calculations to approximate [2.188] using Simpson’s rule with m = 10. With m = 10, we obtain the same result that we obtained for m = 1000 using the trapezoidal rule. Simpson’s rule does not always outperform so dramatically. In Section 3.16, we will consider an application for which the trapezoidal rule routinely outperforms Simpson’s rule. with Simpson’s rule using m = 10.